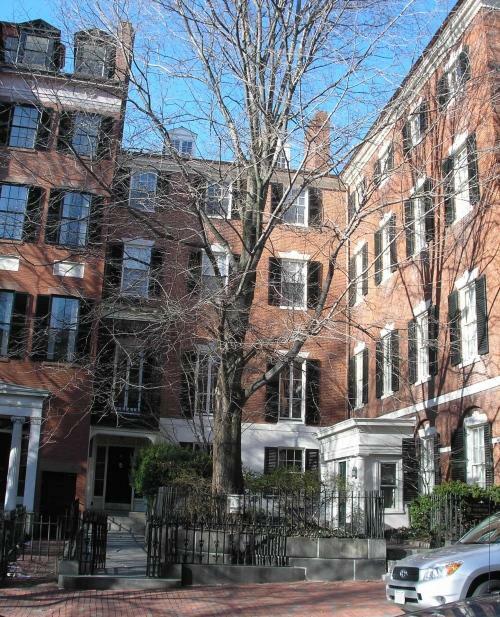 Amid the beautiful townhouses of Boston's historic Beacon Hill district stands the home of a remarkable woman, Miss Rose Standish Nichols. Her four story townhouse at 55 Mount Vernon Street was built in 1804 and is attributed to Charles Bulfinch, renowned Boston architect. The Federal style home contains a dazzling array of artwork collected by the Nichols family, from paintings and prints to antique furniture, silver, textiles, and ceramics. This varied collection spans the globe and centuries as well, representing American, Asian, and European art from the 16th to the 20th centuries. Among the many cherished objects in the Museum's collection are works by Miss Nichols' uncle, Augustus Saint-Gaudens, America's foremost sculptor of the 19th century. Perhaps even more astonishing than her splendid home is the story of Rose Nichols herself. Born in 1872, she was an author, suffragist, lifelong pacifist, and women’s rights activist at a time when women were expected to marry and have children. Miss Nichols chose to do neither, instead supporting herself through a pioneering career in landscape architecture. In fact, she was one of the first women to become a professional landscape designer in the United States. A multi-faceted woman, she also devoted her time to numerous social reform movements and helped found the Women’s International League for Peace and Freedom in 1915. Rose Nichols left her house as a museum so that people could learn about the life of a Boston Brahmin family at the turn of the last century. Since 1961, the Nichols House Museum has been open to the public, offering visitors a glimpse of the unique social history of Beacon Hill during the nineteenth and twentieth centuries.